Excellent jobs have been announced by the Habib Metro Bank for Fresh Graduates. If you have graduated now, you have the best opportunity to apply for this job. 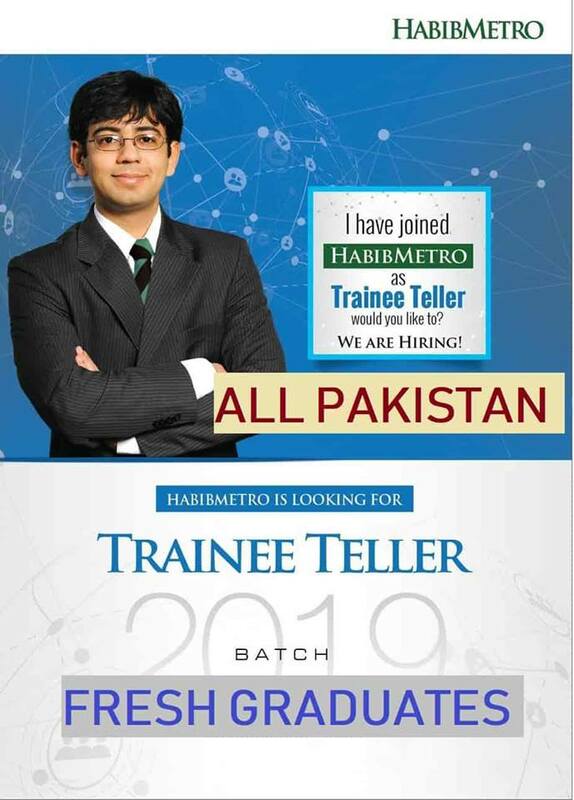 Habib Metro Bank Jobs 2019 for Trainee Tellers Cash Officers Batch. Habib Metro Bank needs people working hard for Cash Officers. Both men and women can apply in the Habib Metro Bank Jobs 2019. Habib Metropolitan Bank, operating as HabibMetro Bank is a Pakistani bank which is based in Karachi. It is a subsidiary of a Swiss banking corporation. Habib Metro Bank has many major cities in Pakistan. You can apply from any city to this job. It is very important for you to have a graduation degree to apply for Habib Metro Bank's job from any HEC recognized institute for this post. You must be 25 years old for this job on 31st January 2019. How to Apply For Habib Metro Bank Jobs 2019? The subject line of the email should be - Trainee Teller, City Name.